Natur House: Slimming Solution for Busy Women. Now in the Philippines! I never thought about going on a diet until I got admitted last 2010 for gallstones. It was very painful that the doctor told me that I need to have a surgery to stop the pain. Since I didn’t want to go under the knife, we didn’t have enough money to pay for it. So I decided to take the alternative way – go on diet. And boy it was so hard! Avoiding all those delicious food (mostly fatty) was like penitence for me. I failed most of the time and of course, get frequent attacks and not losing any weight. I also tried running as a way of losing weight and keep my mind off track with those delicious foodies but due to time constraints and nocturnal lifestyle, I was not able to maintain it. Then one time, a friend of mine helped me. She taught me the importance of a healthy diet and exercise. She guided me on what to do and how to overcome all the temptations. I was doing great until she moved to a different city. Then I concluded that dieting is an easy feat if you have a guide and an accountability partner. Today’s modern woman wears so many hats. She could be a wife, a mother, a homemaker, a student or career woman and because of her busy nature, she hardly finds time for herself and unfortunately in the process sometimes neglects her health and wellness. Most women also resort to binge or stress eating as food becomes her stress buster whenever she gets overwhelmed. How can one then take care of her health when she has no time to go to the gym regularly or when she’s too busy performing other duties and functions. Fortunately for the Filipinos, CF Sharp brought Natur House to the Philippines. What makes Natur House unique and different from other weight-loss supplements and centers in the country is its personalized approach towards weight management. They provide a healthy approach to losing the pounds and inches off a client’s body by providing the assistance of a nutritionist who will guide one’s weight loss goals and objectives. 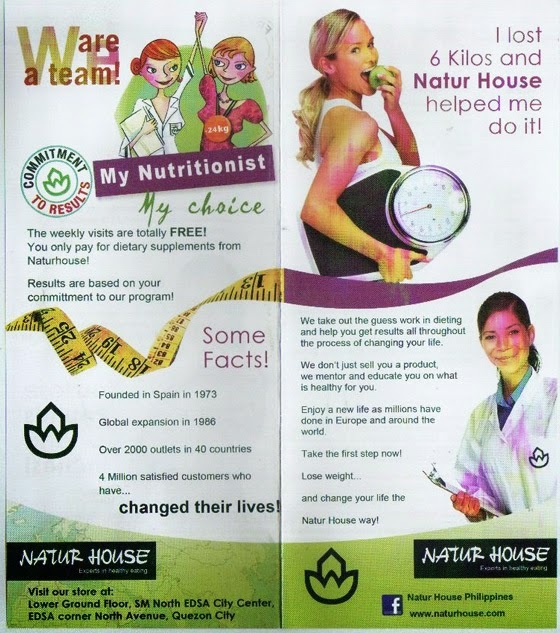 The Natur House way is a partnership between the client and the nutritionist and the Natur House method guarantees not only weight loss but also stabilization and maintenance. The current trend in weight loss nowadays is juicing. However, the process could be too cumbersome for busy women out there. Thus, it is important that other options are available for her. This is where Natur House comes into play. 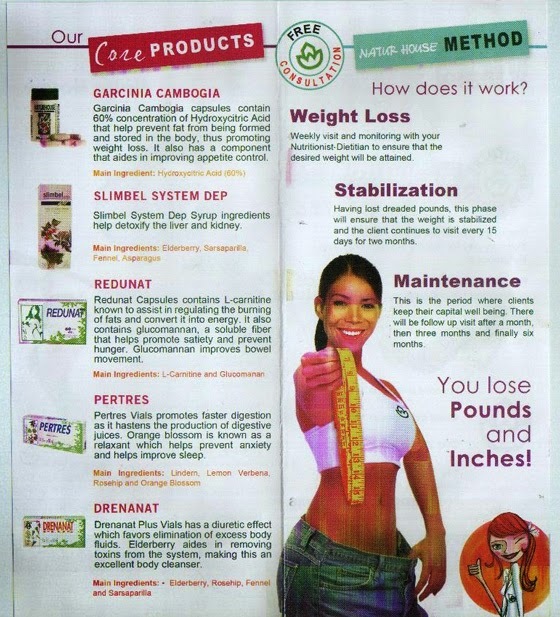 • Garcinia Cambogia – these capsules contain 60% concentration of Hydroxycitric Acid that help prevent fat from being formed and stored in the body, thus promoting weight loss. It also has a component that aids in improving appetite control. • Slimbel System Dep Syrup – the main ingredients for this are elderberry, sarsaparilla, fennel and asparagus. It helps detoxify the liver and kidney. • Redunat – these capsules contain L-carnitine known to assist in regulating the burning of fats and convert it into energy. It also contains glucomannan, a soluble fiber that helps promote satiety and prevent hunger. Glucomannan improves bowel movement. Another ingredient for this capsule is green tea extract that helps improve one’s metabolism. • Pertres – Pertres vials promote faster digestion as it hastens the production of digestive juices. Its main ingredients are linden, lemon verbena, rosehip and orange blossom. • Drenanat – Drenanat plus vials has a diuretic effect which favors elimination of excess body fluids. Its main ingredients are elderberry, rosehip, fennel and sarsaparilla. Elderberry aides in removing toxins from the system, making this an excellent body cleanser. The Natur House way is convenient, affordable, efficient and effective. Just after a few months on the program, you can already feel you have lost weight the easy and healthy way. Embrace the Natur House lifestyle now and be healthier and happier. These products are available at Natur House Philippines located at the Lower Ground Floor, SM North EDSA, Quezon City. Once you visit the store you can also avail of their free nutrition services with their in-house nutritionist. Follow Natur House on Facebook. How much is it Ruby? 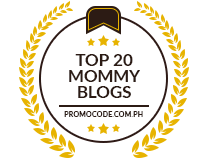 Hi mam Janette and Jessica! I’m a Licensed dietitian from Natur House. You can like our page on fb. Natur House Philippines. What we do here, we first assess the client before we prescribed them food supplements. We give free assessments, free individualized diet and nutrition support. You will only pay for the dietary supplements. For more info you can reach us at 02 893 0614 or 09989653813. Our store is located at BF homes Paranaque City.